Itamar Ben-Gvir (left) and Michael Ben-Ari of the Otzma Yehudit Party outside the elections committee, where political parties running for a spot in the upcoming Israeli elections present their party list, on Feb. 21, 2019. Photo by Yonatan Sindel/Flash90. (March 18, 2019 / JNS) Israel’s Supreme Court banned Otzma Yehudit candidate Michael Ben-Ari from running in the upcoming national elections—the first time Israel’s highest court has ever prevented a single individual from running in an Israeli election—in opposition to a decision by the Central Elections Committee. Ben-Ari has insisted that his remarks were taken intentionally out of context, and that he is not a racist. 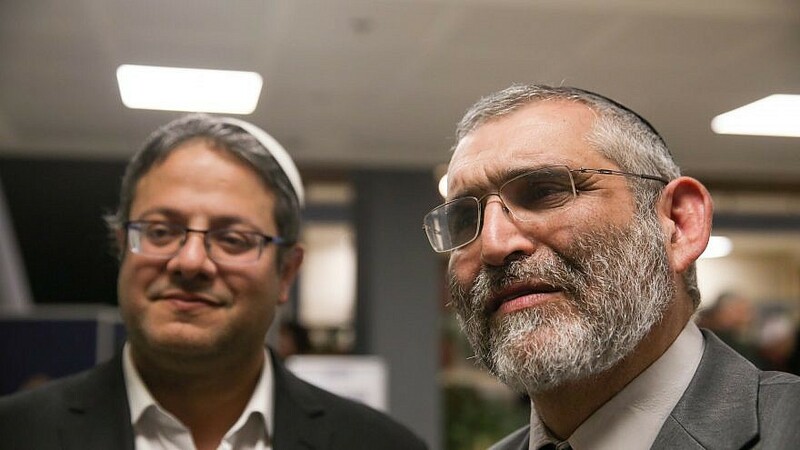 Otzma issued a demand from the Jewish Home Party with which it is partnered, to assure that Otzma candidate Baruch Marzel receive a ministerial position, and that Itamar Ben-Gvir be posted to head the Constitution, Law and Justice Committee in the Knesset. They also demanded that Ben-Gvir be moved from eighth to fifth position in the joint party list of the United Right Wing Parties list. Ben-Ari had been fifth on the list, and Ben-Gvir is expected to be pushed to the seventh slot, due to laws pertaining to shuffling the slates after formal submission of the lists to the Central Elections Committee. Otzma said the demands were made in order to ensure that supporters would still see an incentive in voting for the joint list, despite the setback with Ben-Ari. On Monday, National Union Chairman MK Bezalel Smotrich called a Knesset meeting about the situation. “The Supreme Court justices disqualified a candidate due to his views regarding Israel’s enemies, but approved parties which openly identify with Israel’s enemies. This distortion of justice must be corrected today,” said Smotrich. “In recent days, all of you expressed opposition to this outrageous decision, which is even more outrageous in light of the fact that it allows terror supporters who oppose Israel’s right to exist as a Jewish and democratic state to run for Knesset. “Words are not enough. The Knesset must bring back democracy, for its own sake and that of the nation. I call on you to gather for an urgent meeting, held despite the break. [This meeting] will continue for as long as necessary and quickly pass the attached bill, which cancels the Supreme Court’s right to serve as a high council and will allow Dr. Ben-Ari to run in the upcoming elections.